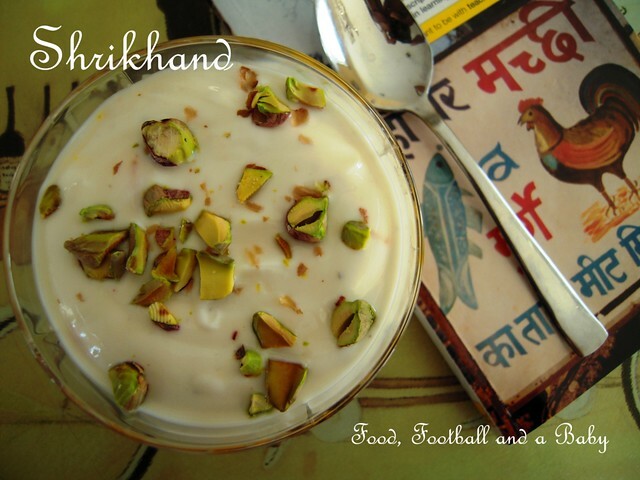 Indian Sweets - Shrikhand - and Some News! First my news. I have found out that a lovely person (thank you!) 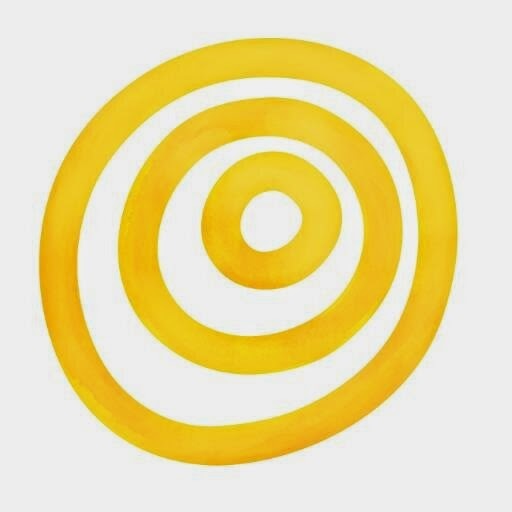 has nominated my blog for Babble's Top 100 Food Mom Blogs for 2011 in the 'Your Favourites' section.. To say I am super excited would be a mild understatement. Eeeeeeeeeeee!!!! I am excited!! Are you? Probably not :-) But I am! And I have a favour to ask of you. If you like my blog and enjoy my recipes, please could you go over to Babble and say you like me? All you have to do is click on the 'I like this' button beside my name. I am listed as Michelle Peters-Jones, and right now I am on Page 1 by popularity and Page 4, alphabetically. So, thanks in advance for your support and I really appreciate it! Here's an additonal link, if you missed the first one. You can also nominate any other favourite mom blog there too. And now that I have got the excitement out of the way, back to the post. For this month's Random Recipe Challenge, Dom over at Belleau Kitchen asked us to make a recipe from our very first cookbooks. Well, turns out I remember my first every cookbook rather well. So well, that I asked my mum to see if she could find a copy for me to own, and lovely mom that she is, she came up trumps. You've probably gathered by now, that the first cookbook I ever owned was when I was seven years old. I purloined my aunt's copy of 'The Mangalore Ladies' Club Cookery Book'... and I loved that book until it vanished in my several moves across three continents :-( Luckily, my mum was able to find a copy in a used book store, in Mangalore, and I am once again the proud owner of this amazing book. As this book has several recipes over two pages, I must admit, I cheated a bit, and took on the recipe that I liked the most. In this case, it happened to be the 'Shrikhand'. 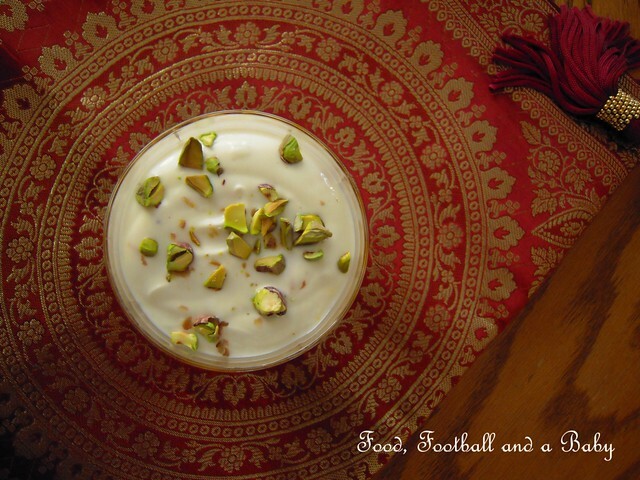 Shrikhand is a yoghurt based Indian dessert, and surprisngly, unlike most Indian desserts, can be made fairly low fat and with minimum sugar. Its also very refreshing after a full Indian meal, and can be varied to include fruits that are in season. I also realised that I had never blogged the Shrikhand recipe that I made for my first ever two course menu on Masterchef. I like to think that it was a combination of this, and that prawn biriyani that carried me over to the quarterfinals that year. If I remember correctly Gregg Wallace described this Shrikhand as 'well balanced' and 'an amazing combination of strong flavours'. I would go and have a look on the video to see what they did say, but I hate seeing myself on DVD now... I look so young and so naive ;-)) Ah, good memories! Anyway, I adapted this Ladies' Club Shrikhand recipe, as I had a bit of left over mango puree that I wanted to use up. But you can vary the fruits to suit you. Or you can just leave out the fruit altogether, and just keep it as yoghurt. The possibilities are endless, and you can pretty much see why we like this dessert so much. Dom managed to get a good one out of me this time round, and whaddaya know, I even managed not to leave it to the last minute! Blend the mango chunks with the sugar into a smooth puree. Alternatively, you could cube the mangoes, and use those instead. Hand the three cups of yoghurt in a cheesecloth, so all the water drips out of it, and you are left with roughly two cups of very thick, creamy yoghurt. This will take around 2 - 4 hours. This step will really enhance the taste and texture of the finished dish, but if you don't have time and/or you're using thick Greek yoghurt, you can skip this step. Crush the cardamom seeds into a fine powder using a mortar and pestle. Dissolve the saffron strands into the rosewater. Obviously the strands won't dissolve completely, but this step is just to extract the colour of the saffron. 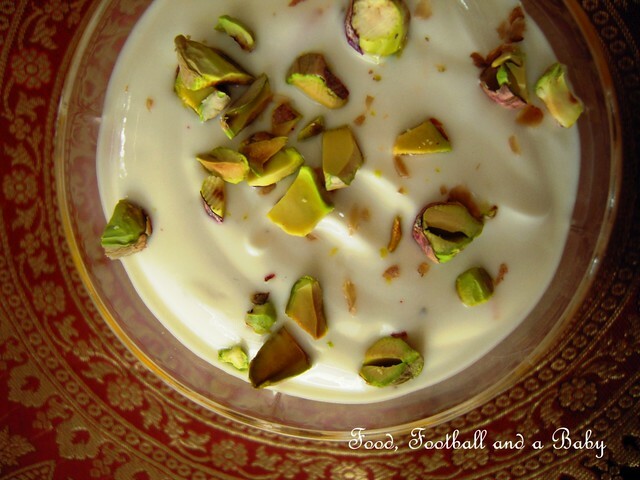 Put the hung yoghurt into a bowl, and whisk in the honey, cardamom and the saffron/ rosewater. Taste, and add a little more honey if you would like it sweeter. Put the yoghurt in the fridge until ready to serve. Toast the pistachios, by tossing them in a hot, heavy pan for roughly 1 minute. Chop them up coarsely. To serve, pour a little mango puree or place the cubes into bowls or glasses. Gently spoon in the yoghurt, and sprinkle the toasted chopped nuts on top. I love this recipe Michelle and the cookbook is brilliant... I love that it must hold a special place in your heart, which I think must be true for so many of us, hopefully this challenge will brink back many happy memories!... thanks for taking part... and congrats on the blog award! Sounds delicious and fairly healthy for a dessert. I'll have to have a go. Sounds like a lovely treat ... I love shrikhand, but have never had a combo like this!!! Love your dish looks fantastic.